The Market at Liberty Place opened in Kennett Square on Friday, July 12. The market is a food court-like area featuring such vendors as Paradocx Vineyard, Kennett Brewing Co., Rick’s Steaks, State Street Grill and others. According to Geoff Bosley, who owns the market with his father, Larry Bosley, the idea began taking shape a year ago. They visited the Reading Market in Philadelphia and similar sites in other big cities and asked themselves if it could work on a smaller scale in a smaller town. 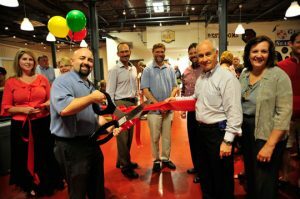 Geoff Bosley, with scissors, cuts the ribbon to officially open The Market at Liberty Place in Kennett Square. He said the gathering place concept fits in well with the rest of the Kennett Square scene. It works with the current commerce and arts communities. While there are already more than a half dozen vendors in the 10,000 square foot market already, Bosley said they are looking for more. “We want not just a food court. We want things to compliment the tremendous vendors we already have,” he said. Specifically, he suggested a produce vendor or a butcher to work in complement with the George & Son Seafood, or some specialty food that’s unique to the area. The market is at 148 West State Street in the borough.